Indoor and outdoor, stone and brick, withfloor to ceiling windows and poluzatenennye - veranda has long evolved from small buildings, which act as ancillary facilities, in spacious and functional rooms. 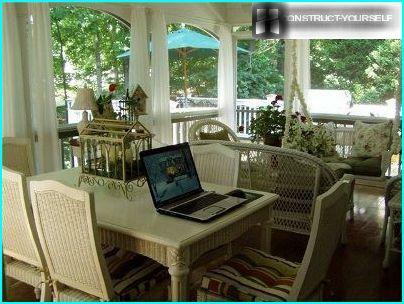 additional area becomes a summer dining room and, if desired, and a haven on a hot day, and, subject to careful insulation, winter garden. It is difficult to say what exactly should be the veranda: their own hands with the same success it is possible to create and modest extension, and luxury room. Veranda never treated as a separatestructure: it is part of the house, which is attached to the main building in the process of building or some time later. Most often it is adjacent to the front or end side, that is to the wall, which is built into the door. So, to get into the house, you must first log on to the veranda. closed - Free from the walls of glazed space (in some cases, the glass area of ​​coverage prevails over the wooden part of the area). When designing the layout and appearance of an extension,should be aware of harmony: the veranda should be merged with the house, match his style, be constructed from similar materials suitable size. The optimal length of the premises - 4-7 m, width - 2,5-3,5 m smaller space is insufficient, and large will look awkward..
Usually even enclosed spaces is not heated, so the veranda often used in the warm season. Before you begin construction, you need to hold a series of preventive measures. On the future should take care in advance. It is possible that in a few years will have to sell, give or rent a vacation home, and then will need documents confirming the legality of the extension. In the opposite case it is necessary to pay the fine and get the same paper, but more complex and time-consuming way. The first step is to apply to the projectorganization that provided by drawing sketches made and the future structure of the project. In this case, it makes no difference how the veranda built in the country: their own hands or with the help of a construction company. With ready design, application, passport and proof of ownership, will have to visit several important instances and wait for approvals, after which you can start building. Last legal bar - new registration home at the end of work. 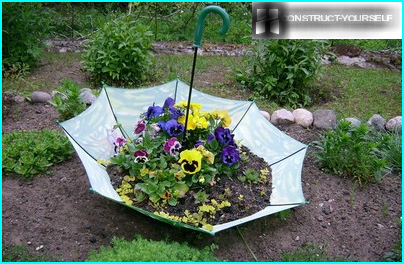 In addition to the documentary side, there andFinancial - the purchase and preparation of building materials. The main principle consists in conformity. For example, if a house is built of laminated veneer lumber, the extension should also do wood. Verandah, Attached brick building should be totally or partially made of brick. Absolutely unacceptable combinations such as brick and concrete blocks or wood and siding. One embodiment, suitable forself-construction - timber frame porch gated. Installation of foundation, walling, roofing material do not require large investments and the use of construction equipment. 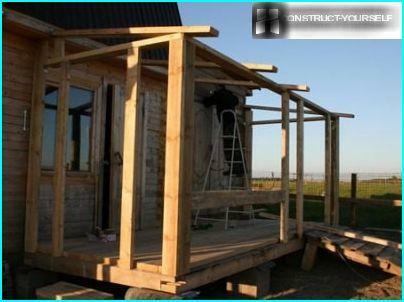 The circuit components of the porch: 1 - stand; 2 - pillars of the foundation; 3 - waistrail; 4 - drain; 5 - Zabirko; 6 - glass; 7 - clapboard siding; 8 - the top rail. 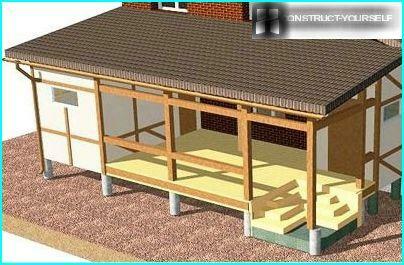 Created with their own hands veranda drawings will help provide all the nuances and avoid mistakes. For example, the advance should calculate the number, size and location of double-glazed windows. Once removed the top layer of soil andmade signs, begin to build the foundation. 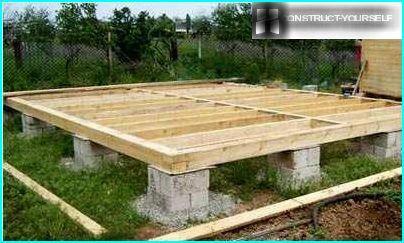 Well, if it is an analog of the house foundation, but it is not always possible. The simplest and quickest embodiment is columnar. erecting poles of ordinary masonry bricks. column height is calculated from the height of the house floor. To the end of the construction of the porch roof fit under the eaves of the building, floor veranda of about 30 cm lower than the floor of the building. 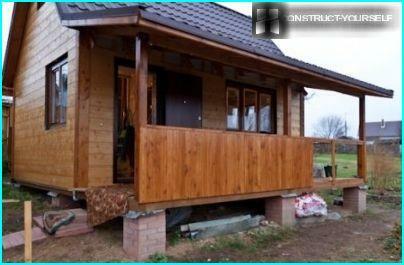 Creating a lasting and stable framework for thefixing the wall elements - an important stage in the construction of a wooden porch with his hands. Perform the lower and upper harness, which serve as material for timber (12 cm diameter) or bars (8 cm x 8 cm, 10 cm x 10 cm). The connection is via "Direct lock". Arranging the lower double harness, crashed on logs2nd level logs and set racks that hold the metal staples and nails. At the top of the harness equipped with a second set and rafters. The upper ends of the rafters connect to the beam, under the slope of the roof of the building. For connecting horizontal elements and struts use bolts. How to trim wall verandah to the framewithstood the weight of the structure? 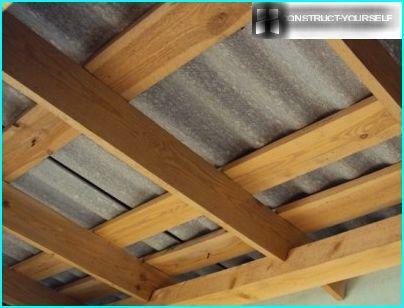 For this purpose, a relatively lightweight materials - battens or boards. 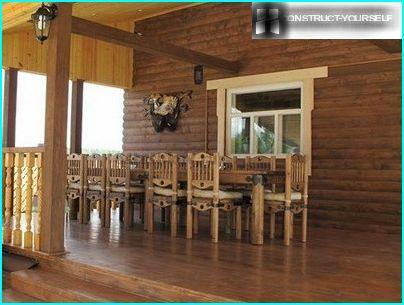 Each type of wood material has its own particular installation. For example, the horizontal arrangement of the elements (which is preferred) battens customize close strap to the bar and joined the board overlap. 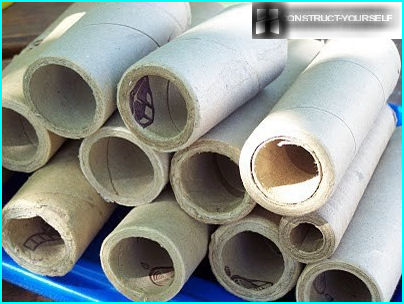 From inside the pavinginsulating material, which is sold in the form of plates or rolls. Furnish the room is performed using plasterboard or chipboard panels. 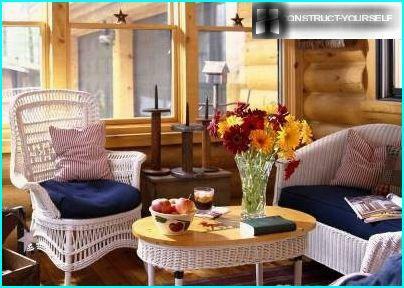 Options for decorating the interior are many: the formulation depends on the destination veranda. The configuration of the roof has several outbuildingsoptions, but the most popular is the type of single-slope roofs - easy to implement and, as a rule, blends perfectly with the roof of the house. Rafters are placed at an angle: the upper ends are fixed under the slope, based on the lower walls. As roofing use the samethe material that was used for the roof of the building equipment. It is important to match and texture, and color. 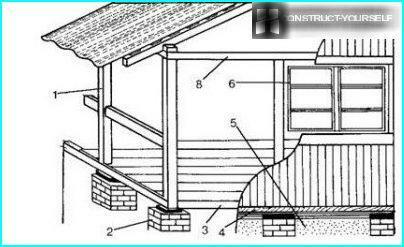 Typically, when building a porch with his hands, used material, easy to mount, for example, soft tile, metal roofing or roofing material. the lower edge of the roofing nail and buckled. The best material for the floor - treated wood board about 30 mm thick. The width may vary, but typically takesarticles about 85-120 mm. Boards are placed on the joists, using a heat-insulating layer. The upper surface of the floor must be flat and smooth. 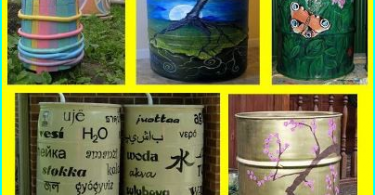 Every detail is treated with a protective agent, and after laying cover with paint or varnish. 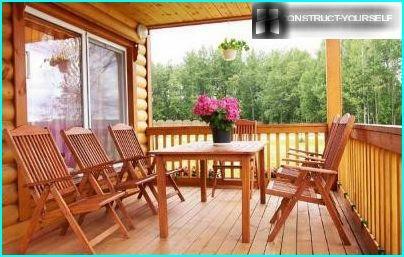 Veranda in the country can be constructed usingready-glazed windows. Their size depends on the total area of ​​the premises and the degree of illumination. The larger the window, the easier it looks finished structure. Especially good sliding design, allowing the warmer time of converting a closed to an open veranda.